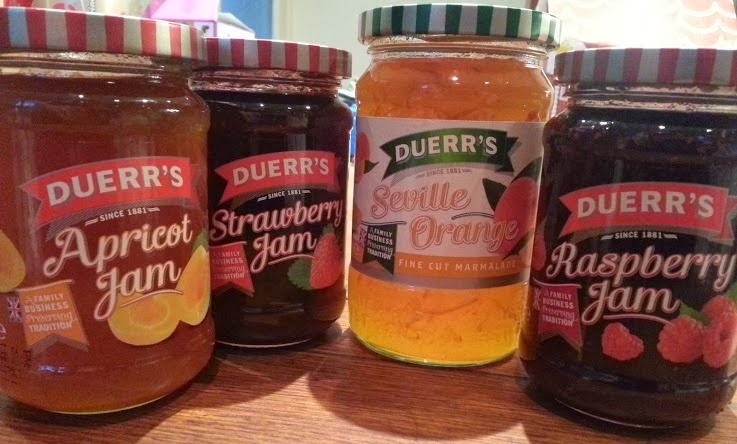 Duerr's are a fairly local company to me, and they have been making jams, marmalades and other preserves in a family-owned Manchester business for the last 132 years. They've brought out a series of great videos showcasing recipes which use their preserves and are easy enough for anyone to attempt. The video series is called 'Baking For Boys' and features comedy double act Richard Duerr and Duerr's Operations Director Paul, and they do make a very entertaining duo. 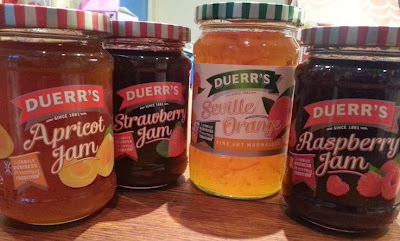 Duerr's have sent me some of their jams and marmalade and asked me if I'd watch the videos and try some of the recipes out. As they feature things like Marmalade Bread And Butter Pudding and Chocolate Orange Cake, how could I refuse? The first video I'm trying is a cheat for me really. 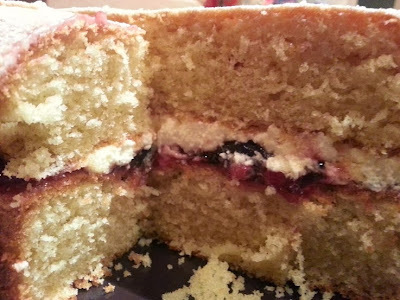 It's a Victoria Sponge, which is a recipe I've used a bazillion times, it's incredibly handy to be able to make and impresses everyone - especially at birthday time. They give handy tips in the video and make it look incredibly easy, but that's mainly because it is! I followed all their instructions, so did mine look like theirs? It did really. It's not as tall as theirs, but I don't have a food processor to whip the mixture up and my tin was a bit big, but it's still lovely and light and a good sized cake. 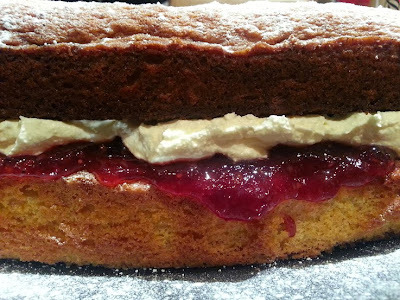 My family love a jam sponge and the Duerr's raspberry jam is chunky and well-flavoured, perfect to go with cream and sweet cake. I was sent the preserves shown above in order to try the recipes. A little old lady recommended Duerrs to me in Asda a couple of weeks ago. Seriously. I was staring at jams wondering which to buy & she said 'Buy that one, it's the best jam I've ever had'. Well you don't ignore that! And she was right - best jam we've had. Nice looking cake. 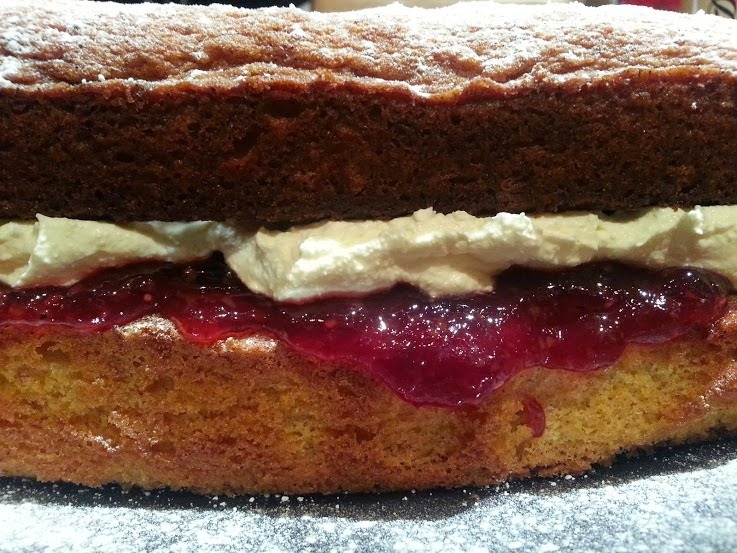 I do love a good Victoria sponge! Never heard of Duerr's, so will have to try it. Your cake looks yummy!! 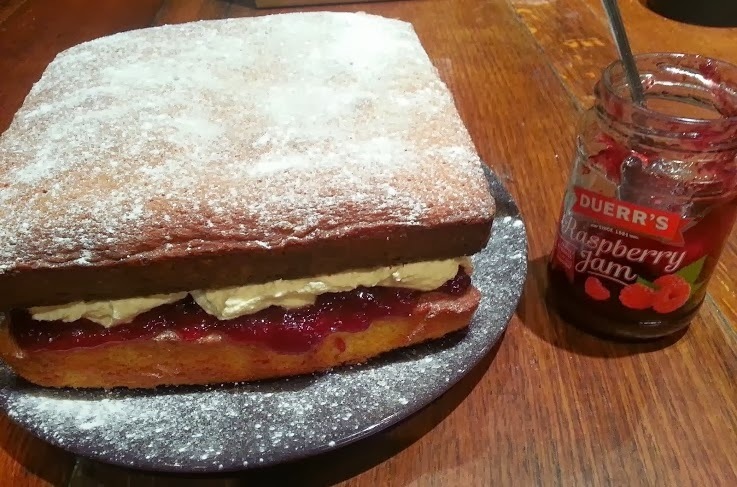 Miss M has requested a jam and cream cake for her birthday so may have to try this. I love a Victoria Sponge!! Lovely sponge! Looks delish, bet it didn't last long! Reminds me of my Granny's cakes! I can't make sponges anywhere near the size her's would rise. We love Jam and love cake, so thank you for pictures of both - Made me drool!